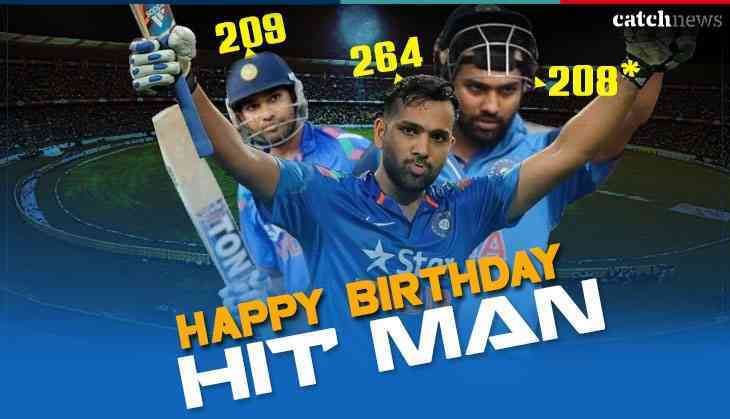 It's Rohit Sharma's Birthday. The ace Indian batsman turned 31 today. He is also the vice-captain of the Indian national team. Rohit Sharma made his International debut against Ireland on June 23, 2007. He started his career at a small age of 20 years but he always had the technique and temperament of a mature player. He started off his career as an opening batsman for India and has since then been consistent with his performance with a few ups and downs in his career. He scored consecutive centuries in his first two Test matches against the West Indies in November 2013, scoring 177 at the Eden Gardens in Kolkata on debut, followed by a score of 111* in the next Test at the Wankhede Stadium in India. He happens to be the only batsman who has scored a double century thrice in the One Day Internationals. He is also the highest run-getter in the ODIs in a single inning. Interestingly, Rohit Sharma played 108 ODIs before playing his first Test match. He has also scored 106 in one of the T20 matches and became the second Indian to have hit a century in all the three formats of the game. Moreover, his achievements in the IPL are incomparable to anyone else. He has successfully led his team Mumbai Indians to the title, thrice. He has been struggling with the performance of his team this season of the Indian Premier League. Mumbai stands at the bottom-most spot presently. They defeated the mighty CSK in their last clash. Mumbai Indians would need to win all their matches to reach the playoffs.